← Does the new Women Empowerment and Gender Equality Bill fill the gaps? 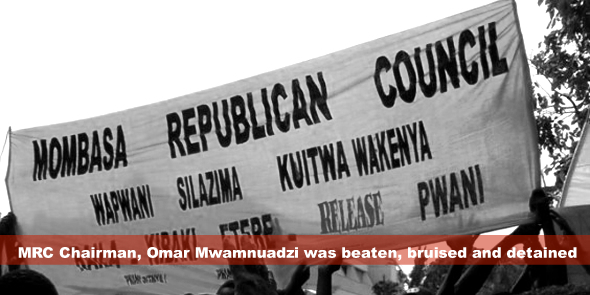 In celebrating the crackdown, the Kenyan media carried a picture of Mwamnuadzi, bleeding, bruised and badly beaten. The comments on social media evidenced a certain public glee at the torture Mwamnuadzi had received. Further, it showed the nonfading tendency of “law enforcers” to brutalise (suspected) offenders and recalled the brutal crushing of other proscribed violent groups, the Mungiki and the separatist Sabaot Land Defence Force in 2007 and 2008 respectively. The very public assertion of a “moral state brutality” alludes to a public insensitive or ignorant – or both – to the universality of human dignity that we so proudly celebrate in our new Constitution. Soin Kenya, we must reassert the obvious: Human rights are inherent to all, criminals or not. Being humane to suspected criminals, no matter how vile their alleged actions, re-affirms that their alleged vile acts have not reduced our humanity. Conversely, our brutality, either direct or the public glee at it being done, reflects our own dehumanised state. Kenyan society is numbed by unending acts of violence on a daily basis: carjacking, robberies, rapes, atrocious mob lynching and moral-less politics. The violence in Kenyan society is blatant, and it is not sufficiently condemned. After all, if suspected criminals “deserved” brutal treatment, then why have we not seen bruised faces of the International Criminal Court suspects who allegedly orchestrated rapes, murders, arson, ethnic cleansing and overall crimes against humanity that we suffered in post-election violence? It does not suffice either to argue that force is needed to apprehend suspects. There is a tendency in Kenyan society to associate legitimate use of force with its disproportionate immoral use. On the streets, the typical refrain to “Catch that thief!” is “burn him, burn him!” Indeed, catch the thief, but burn him? Alive? For pickpocketing? Use of force is legitimate, but must be necessary and proportional. If shots were fired at arresting officers, then one would understand a proportional response. Bullet ridden bodies or extensively bruised faces that bear witness to the repeated contact with rifle butts and boots are by all means disproportional and unnecessary to secure arrest. It is also current to claim a necessary correlation between high rates of violent crime and systemic police brutality. This is false as police brutality in Kenya predates high levels of violent crime. After all, the force was created to suppress the African colonial subjects, and many researchers concur that that the Kenya Police is yet to shed that organisational culture. High incidence of violent crime has co-existed with police brutality for decades in Kenya, and the former seems rather unperturbed by the latter. Brutality serves neither as a deterrent to crime, nor does it secure the physical safety of our officers in the line of duty. The claim goes further to equate rejecting police brutality to promoting violent crime. We ought to reject this incorrect assumption, between a brutal retributive police force, and the tyranny of criminals. There is a third way: a just way. One where force is used intelligently, professionally, proportionally and without retribution. The force that the state constitutionally and morally monopolises is a just one. But even more relevant to the tenacity of disproportionate use of force by police is the perception that the criminals deserve it. No human action makes one worthy of rights. No one’s actions make them deserve human rights. They are inherent simply because one is human. Therefore, no actions make one unworthy of human rights either! This crystallises what the older National Anthem has sang for decades. In its third line, immediately after recognising God, it affirms justice to be the nation’s “shield and defender”. If suspected criminals have harmed us, then let justice be our shield against that harm. And if finally national ideals seem too idealistic, then at least oppose state brutality on selfish grounds. One cannot enjoy those human rights that one denies others. It’s an all or nothing proposition. And that is the bitter pill of freedom. If you want it for yourself, you must guarantee it for all. Then again, if the British were wrong to torture the Mau Mau – brutally so – then how can we possibly accept state brutality today? Humphrey Sipalla is a teacher, writer and editor. The Publications and Communications Officer at the Institute for Human Rights and Development in Africa (IHRDA), he is currently on study leave as MA candidate for International Law and Human Rights at the UN Mandated University for Peace in Costa Rica. His research interests are in theology, social justice, human rights law and the African renaissance. He writes in his personal capacity. Its wonderful as your other blog posts : D, appreciate it for putting up. “It takes less time to do things right than to explain why you did it wrong.” by Henry Wadsworth Longfellow.